Politicians are often accused of patronising encroachments and illegal constructions in the city. In a classic example of political backing, a senior Congress leader disrupted an anti-encroachment drive of the MC in the Jawahar Nagar Camp area of the city this afternoon. Some Congress councillors disrupted another anti-encroachment drive in Ghumar Mandi, while a senior BJP leader disrupted a drive on Hambran Road. The National Anti-Doping Agency (NADA) took samples of four players of the Indian and Pakistan kabaddi teams after the final match of the World Cup Kabaddi held here on December 14. Thirty-four year after Chief Minister Parkash Singh Badal laid the foundation stone of a government degree college in Ahmedgarh at MGMN Senior Secondary School, students of the region have to travel long distances to pursue higher studies. 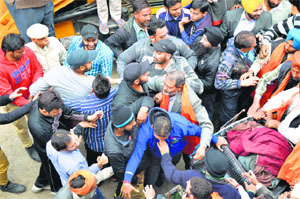 Rift within the Bharatiya Janata Party came to the fore today when supporters of councillor Gurdeep Singh Neetu and a former health minister Sat Pal Gosain entered into a scuffle during the start of a project to cover Ganda Nullah. This work on the project that had been delayed for several months started today after the release of Rs 5 crore. The Greater Ludhiana Area Development Authority (GLADA) today sold 23 commercial sites in Urban Estate, Sector 38, on the Ludhiana-Chandigarh Road raking in a total sale price of Rs 17.95 crore with a premium of around 74 per cent over the floor price of Rs 10.29 crore of these properties. 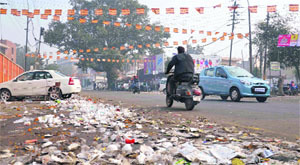 Litter on the road after the Jagannath Yatra last evening left the residents fuming as they woke up this morning. Starting from Durga Mata Mandir near Jagraon Bridge, the yatra passed through Fountain Chowk, Rani Jhansi Road, Ferozepur Road and finally ended at Durga Mata Mandir in Sarabha Nagar. As poll season gathers momentum, the Central Board of Direct Taxes (CBDT) has brought out a 19-point fresh standard format for "Electoral Trusts", created by corporate and business houses to fund political parties. 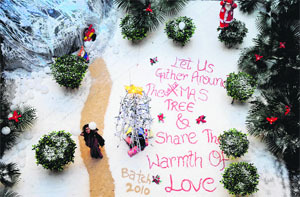 A special Christmas carol service was held at the Lady Willingdon Hall of Christian Medical College and Hospital. The programme began with prayer by Rev. Alex peter Chaplain. The Director, Dr Abraham G Thomas, welcomed the guests and wished them a Merry Christmas and a blessed New Year. The dignitaries present included the Vice -Chancellor, PAU, deputy director Dr Vijay Obed, medical superintendent Dr Kanwal Masih, medical college principal Dr S Bhatti, Dental College principal Dr Abhi M Thomas etc. Dubai-based businessman and philanthropist SP Singh Oberoi, who rescued Indian youths in Dubai by paying “Blood money” was honoured at Gurdwara Sukhmani Sahib, Dugri, today. Employees of PUDA/GLADA today joined their respective duties after holding two-day pen down strike on December 12 and 13. It was only after an assurance by the authorities to concede to their genuine demands that the protesters joined back their duties. The Union Information and Broadcasting Minister, Manish Tewari, has strongly opposed the move to sell the prime land belonging to the Punjab State Power Corporation Limited at Sarabha Nagar in Ludhiana. 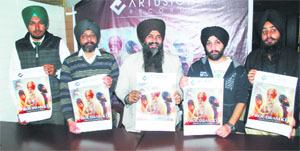 The Artusion Records today released music of the forthcoming Punjabi movie titled ‘Proud to be Sikh’. Along with other promoters of the movie, Tavleen Singh from the music banner released four tracks of the movie. Three tracks of the movie have been composed by Tavleen Singh and one by Vgrooves. The People's Party of Punjab, Fatehgarh Sahib district, staged a dharna and a hunger strike against the imposition of the property tax and alleged anti-industrial policies of the Akali-BJP government in the state at the main bazaar here today. The cancellation of representation of non-teaching employees in the board of management is all set to hog limelight during the upcoming elections of the Punjab Agricultural University Employees Union on January 10. Merely 19.4 per cent of the population, between the 18-23 years of age, was found to be enrolled in colleges for higher education, while about 80 per cent of the youngsters were not able to seek higher education at all. In Punjab, only three lakh candidates out of total nine lakh candidates (youngsters) were able to get higher education. This was revealed by the secretary, Higher Education, Government of Punjab, RS Sankaria, during the stakeholders' conference on Rashtriya Uchtar Shikhsha Abhiyan (RUSA) at Government College for Women, here today. Sakaria was the chief guest on the occasion. Panic spread in Jagatpuri and the surrounding area after the body of a 42-year- old woman was found hanging from a ceiling fan at a cloth manufacturing unit at Shamsher Nagar. The deceased has been identified as Shahjahan Beg, alias Vimla (42), deserted wife of Akbar Beg, who was living along with her son in Shamsher Nagar. A 19-year-old girl comitted suicide by hanging herself from a ceiling fan at her house located in Bhamian Khurd. Hundreds of commuters were left stranded after two railway-level crossings, Shastri Nagar and Pakhowal Road, were closed after a man jumped in front of a train. The annual All-India Sahibzada Ajit Singh Hockey Championship Trophy is going to start from tomorrow at the Olympian Prithipal Hockey AstroTurf Stadium of the Punjab Agricultural University campus. Office-bearers of the Sports Council of Ludhiana said that all arrangements had been made for the tournament.